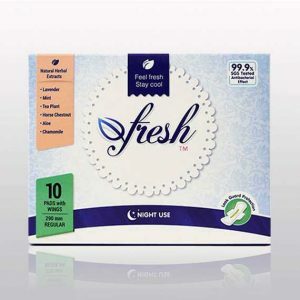 Afresh® Pads keep you feeling fresh and cool all day long. Afresh Sanitary Pads can truly give you the freshness for the entire time you are wearing them, without using any chemical scents..
Each pad contains an ideal blend of herbal extracts which flow naturally through the breathable layers, resulting in a 99.9% anti-bacterial effect, helping to control codour, soothe itchy skin. Special double wing design gives you extra secure all night. Individually packed pouch also makes AFRESH Sanitary Pad convenient and handbag friendly. To my surprise, I was suddenly relieved of itching and it made me feel less irritable and much happier. They were amazing, very absorbent and I felt no discomfort whatsoever. I felt fresh the whole day, cool and confident. The night use pads are comfortable and light, kept me fresh and I woke up leak-free. Afresh pads smell really fresh and minty, so much better than perfumed sanitary products. Didn’t expect a “tingle” but got over it and left me feeling fresh and hygienic all day. The night pads lasted from when I went to sleep to when I woke up in the morning, no leaks, and I work feeling as fresh as I went to sleep. I suffer with fibroids, so finding pads that can withhold this amount of blood loss is very hard. Afresh night use pads are excellent! (no mess, no leaks). Afresh day use pads are brilliant too. The liners are also good for those in-between days. I’ve told all my family and friends to give them a try, as I know they won’t be disappointed.